Marella Cruises (formerly Thomson Cruises) is a British cruise line, operated by TUI UK, offering cruise holidays around Europe, the Caribbean, and Asia. 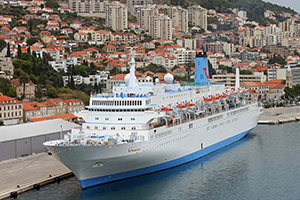 On the 9th October 2017, TUI announced that Thomson Cruises would be rebranded in late October 2017 as Marella Cruises, with all of the existing Thomson fleet adopting the name change either from Thomson or TUI to Marella (except Thomson Spirit which will be renamed Spirit and Thomson Majesty which will be transferred to Celestyal Cruises). The line also announced that it would base TUI Discovery in Asia for the Winter season of 2018, with the ship being based out of Malaysia, the first in the line's history. The company had initially entered the cruise market in 1973, but due to rising fuel costs, the venture was terminated in 1976. In 1995, Thomson restarted their cruise line after their competitor Airtours had made a successful entry in the cruise business under their Sun Cruises brand. 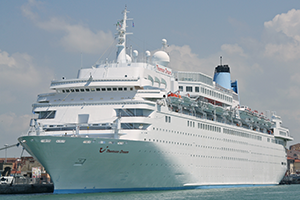 Marella Cruises holds approximately a 1% market share of the worldwide cruise industry. Marella Celebration. Built: 1984. 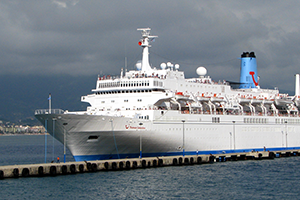 Entered service with Marella Cruises: 2005. Gross tonnage: 33,960. Previously Noordam, Thomson Celebration. Renamed Marella Celebration in October 2017. Marella Dream. Built: 1986. Entered service with Marella Cruises: 2010. Gross tonnage: 54,763. Previously Homeric, Westerdam, Costa Europa, Thomson Dream. Renamed Marella Dream in October 2017. Marella Discovery. Built: 1996. Entered service with Marella Cruises: 2016. Gross tonnage: 69,130. Previously Splendour of the Seas, TUI Discovery. Renamed Marella Discovery in October 2017. Marella Discovery II. Built: 1995. Entered service with Marella Cruises: 2017. Gross tonnage: 69,130. Previously Legend of the Seas, TUI Discovery II. Renamed Marella Discovery II in October 2017. Marella Explorer. Built: 1996. Entered service with Marella Cruises: 2018. Gross tonnage: 76,522. Previously Celebrity Galaxy, Mein Schiff 1, she has been sold to Marella in 2018. Marella Explorer II. Built: 1995. Entered service with Marella Cruises: 2019. Gross tonnage: 71,545. Previously Celebrity Century, SkySea Golden Era, she has been sold to Marella in 2019.